Las Vegas - Jayar Inson, the second Filipino warrior in the undercard of Manny Pacquiao Vs. Adrien Broner, suffered the same fate of his countrymen Rey Perez who fought ahead of him at the MGM Grand Garden Arena. 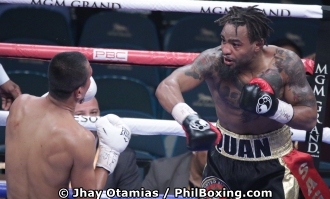 Inson lost by split decision to Jonathan Steele of Dallas, Texas in a brawl of an eight- round welterweight bout. Steele dropped Inson in the closing seconds of the first from an early attack that surprised the Filipino pug from Davao. Inson survived the early knockdown and exchanged heavy shots against Steele starting in the 3rd round. A back and forth in punches and momentum ensued until the final bell. Inson had a brilliant 7th and 8th round, where he hurt Steele with his left hand but the American never went down from it. A lack of defense from the Filipino made him a sucker for a counter punch from the enemy. Scores at the end of the contest were 77-74 for Inson, 77-74 for Steele, and 78-73 again for Steele.